Sausage Polish- Hello everybody, welcome back with ZetiraKitchen! Today i will share about Polish Sausage. 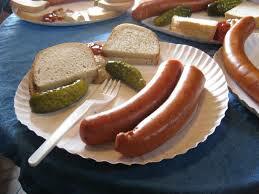 In Poland, sausages are called kielbasa. The origin of sausage is made using pork or mixture of pork and beef and the sleeves of sausage using pig intestine measuring 36-38mm. it Usually added a little flavoring like salt, pepper, garlic, and marjoram, and many other. Each family has different way of processing sausages. It can served with boiled and browned or baked or even sautéed with onions. It is served hot or cold often and chrzan or ćwikła, with sauerkraut or noodles, and as a sandwich on rye bread. It should available in your Christmas, Easter, and in żurek soup on Easter morning. Before you made some delicious meal with this sausage, you can do the following steps. Add the sausage in skillet.